‘Of all the trees that are in the wood, the holly bears the crown’. Imagine you are camping in the wildwood, living on foraged foods, spring water and fresh air, immersing yourself and allowing nature to feed all your senses. Imagine spending several days and nights walking among tall trees, bathing in the river, spotting birds and animals, observing the patterns of caterpillar trails on leaves, night-sky gazing (you get the picture). You dress yourself in nature’s fabric, literally make a costume of bark, moss and leaves. Enveloped in vegetation you come to know yourself as intrinsically part of the natural world and to have access to the infinite life force that it expresses. You feel ecstatic and filled with power, radiant. You are the Green Man or Green Woman of the Wildwood. This idea may sound strange but to the Druids of old, whose reverence for nature formed the foundation of their beliefs, this initiatory process enabled them to access great energy and wisdom. We see this reflected in the ancient myths of guardian spirits such as Gogmagog who represents primal wildness and untameable strength. Later this image was reinvented in the less potent form of The Green Man. This popular and enduring archetype can be found incorporated into many public buildings bringing good fortune wherever it is found. In folk customs the Green Man is dual aspected as the Holly king and the Oak king. From winter solstice to summer solstice, the Oak king rules before being usurped by Holly, who then rules the darker half of the year. It is easy to see why holly holds such an important role at the time of year when energy is withdrawing and the days are getting shorter. The great profusion of holly that existed in past times must have made a dramatic and invigorating display in the winter months. Needwood forest in Staffordshire was particularly abundant with holly until the enclosures act of 1803 when, according to Professor David Mabberley, 150,000 holly trees were taken to provide bobbins for the cotton mills in Lancashire. The year has its seasons, life has its ups and downs, but holly reminds us of that which is ever-present, unchanging. Indeed in the darkest times it produces bright red berries, expressing bold vitality, contrasting beautifully with its spiny, dark green leaves, cheering the spirits and providing food for blackbirds, fieldfares, redwings and thrushes. The leaf litter of holly also provides good protection for hibernating hedgehogs, toads and slow worms and in the warmer months birds nest in its boughs and its tiny white flowers provide nectar and pollen for bees and the caterpillars of the holly blue butterfly. 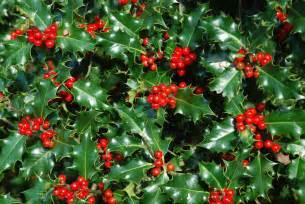 Holly’s protective aspect is seen in its ability to conduct lightening through its spiky leaves, giving it immunity to damage by lightning. It is considered lucky to keep a small branch hung outside the house to guard against lightning. Holly is dioeceous, that is, the male and female organs are on separate plants. The flowers of the male plants are fragrant but only the female trees produce berries. Often small and shrub like, holly can however grow to heights of 20m (though there is a 70ft tree at Brampton Bryan Park in Herefordshire) with its tough leathery leaves becoming less spiny the further they are from the ground and grazing animals. The leaves may also be used to protect seed drills from small mammals. Its bark is smooth and pale giving it a graceful, feminine quality that counterbalances its bold masculinity. Its wood has been traditional used for knife handles, door sills (again lending its protection to the home), joinery, cabinet making, mathematical instruments, engraving and veneering. The wood accepts dyes readily and has been used as a substitute for ebony. Its fine grain makes it suitable for turning fine objects and has been used to make chess pieces. Traditionally boot polish was used to darken them. Holly burns hot and its charcoal was used for making swords and axeheads. Unsurprisingly, its ruling planet is Mars. So bring holly into your home in the winter months to shelter the elves and fairies and to provide a reminder of the tenacity of life. It may give protection not only from lightening but also from deception and manipulation, assisting you to stay present, centred and to avoid being drawn into dramas. It lifts the spirits, connects us with unconditional love, transforms our prickly bits and a berry or leaf carried in the pocket imparts attractiveness! You may even wish to connect with your inner wildman/woman here in the wildwood and possibly hear the tale of how Taliesin used a burnt holly twig to enchant the horses of a king in a competition to win the freedom of Prince Elfin.